There’s no shortage of apps and websites to help lonely hearts find love, but there’s only one voice-activated digital assistant playing matchmaker for tech-savvy singles. Amazon is teaming up with online dating platform eHarmony to launch a new skill for its AI-equipped, hands-free Alexa speaker. eHarmony users who enable the skill will be able to hear their matches and messages by voice, and ask Alexa for more details about their dating prospects. 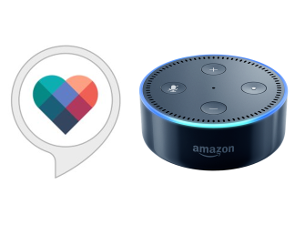 The ability to access eHarmony matches through Alexa is the latest move by eHarmony to make it easier for people to connect and date in a fast paced world. "Alexa provides a unique, human element to eHarmony," said Grant Langston, chief executive officer of eHarmony, in a statement. "The eHarmony skill for Alexa advises singles on matches who are compatible and sent messages. The eHarmony skill for Alexa also surfaces pertinent information, like location and occupation that some people might gloss over if they are just quickly swiping at attractive pictures. With the eHarmony skill for Alexa, people can focus more on the other elements of a profile by listening to her." Singles in the United States this weekend get a chance to try out eHarmony.com and message matches for free. It starts Friday October 6th and continues to late Monday evening, October 9th 2017. No coupon code or credit card is required to message your match for free. All you need to do is sign up as a free member and create a profile. Once that is done you can then go ahead and take the personality questionnaire which is used by eHarmony to determine your matches. This takes about 20 to 30 minutes. Once complete you will receive your first batch of matches. From here you can take a look at their profiles and contact the ones you like. eHarmony is usually extra busy during free communication events so it is an ideal time to try out the service since a lot of other singles will be doing the same. The only feature not available during this event is viewing of profile photos. To be able to do this you must become an eHarmony subscriber. For more on this dating service known for creating long term relationships, please read our review of eHarmony. eHarmony is offering 50% off a 3 month membership this Saturday and Sunday here in the United States. This 2 day promotion runs from September 30th to October 1st, 2017. A coupon code is required and when you purchase a 3 month plan you should save about $45. In order to use the code you will need to first create a free membership and profile on eHarmony. After you have given eHarmony your basic profile details you will need to complete the personality questionnaire. This takes about 30 minutes to complete and is the information eHarmony will use to match you with other members using their famous matchmaking algorithm. Once the questionnaire is complete you will receive your first batch of matches right away. Take a look at your matches profiles and pictures and I am sure you will find a couple that interest you. If you want to communicate with them you will then need to purchase a subscription to the service. At this point when you give your credit card is when you will enter the coupon code. For more on eHarmony, you can read our review. To celebrate Labor Day in the United States, and Canada eHarmony is having a Free Communication Weekend. It starts Thursday August 31st and runs to the end of day on Monday September 4th for the United States and Canada. So All you need to do to participate is create a free eHarmony membership by visiting them online. No credit card or coupon code is required. Just signup as a new member, fill in your profile, and answer the personality questionnaire. This process takes about 30 minutes. It is important to take the time and answer the questions as it helps eHarmony match you with other members. Once your profile is complete you will then receive your first set of matches (new ones are sent everyday). You can then review the matches and communicate with the ones you like by using the eHarmony messaging system. One thing to note is that profile photos are not included with Free Weekends. To view them you will need to become a paying member. To find out more about this online matchmaking service, please check out our review of eHarmony. For 6 days eHarmony in the United Kingdom is offering free trial memberships to new members. From the 24th - 29th August, 2017 are when these trial memberships are available. So what does a free trial get you? Well it means you are allowed to communicate (send and receive messages) to any match you receive on eHarmony.co.uk! To increase your chances of finding your long term partner all you need to do is signup to eHarmony and fill in the profile and questionnaire. No credit card is required. Then eHarmony's matching algorithm will send you a bunch of new quality matches everyday for you to review. If any spark your interest you can then message them right away. eHarmony is extra busy during the free trials so if you are interested, it is recommended you sign up at the beginning of the promotion so you have more time to use the dating service. One thing to note is that during the free trial period photos are not displayed with the profiles. For more information about this United Kingdom dating service, please read our review of eHarmony in the UK. Starting Friday August 18th and running to the end of day on Monday August 21st eHarmony.com members can communicate with their matches for free in the United States. No credit card is required for this promotion so if you are interested in trying out the dating service known for creating long-term relationships then this weekend is the ideal time for you to find out how everything works at eHarmony before spending any money. All you need to do is create a free membership on eHarmony, fill in your profile information, and then take the personality questionnaire. The questionnaire is an important part of the automated matchmaking and takes about 20 minutes to complete. When you are finished you will receive your first daily batch of high quality matches which you can then send messages to the ones which spark your interest. The only thing not included in free messaging of matches, is viewing of profile photos.